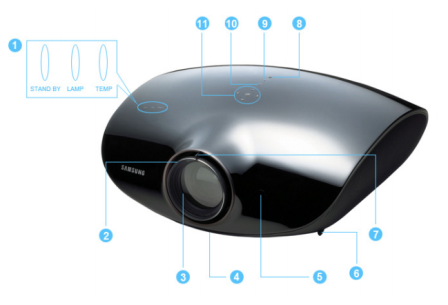 For owner of the Samsung SP-A900B Projector, here you can download operating manual in pdf format. It's available in english and spanish language. The manual provide many reference information especially about problem solving or troubleshooting guide. 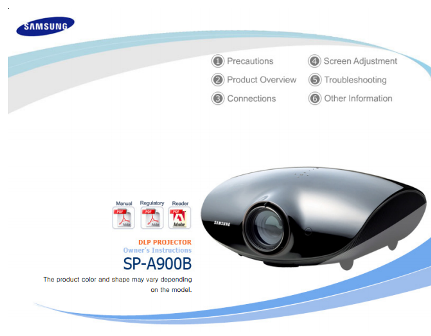 The Samsung SP-A900B Projector user manual contains instruction such as about projector layout and key functions, full specifications, Installing the Projector, Zoom and Focus Adjustment settings,Leveling with Adjustable Feet, Adjusting the Lens Position Moving Dial, Screen Size and Projection Distance, and Setting up the PC Environment. Then in the Samsung SP-A900B Projector owner's manual also provided information such as about connecting the power, Connecting a DVD player/Cable/Satellite Box to HDMI/DVI, Using the Projector, Connecting a DVD player/Cable/Satellite Box via Component, Connecting to VCR/Camcorder, Connecting to PC. Further about care and maintenance such as To clean the exterior and lens of the projector, To clean the interior of the projector, and Lamp Replacement. No Power: Check the power cable connections. I want to install my projector on the ceiling: The ceiling installation support is sold separately. Contact your local product distributor. External Source can not be selected: Be sure that the connection cable(s) (video) is properly connected to the proper port. If the device is not connected properly, it can not be selected. Be sure that the proper external source is selected. Check the battery of your remote control. If its size is incorrect, replace it with the recommended battery size. Check whether the polarity of the installed battery is correct. Check whether your remote control is at a right angle and at the correct distance. Remove any obstacles between your remote control and the product. Direct lighting of 3-way light bulbs or other lighting device on the remote sensor of the projector may affect the sensitivity and cause the remote control to malfunction. Check if the remote control battery is empty: Check whether the LED indicator on the top of the projector is turned on. I cannot select a menu: Check if the menu is displayed in gray. A gray-colored menu is unavailable. Check that the connectors are properly connected to the ports at the back of the projector. Check the Remote Control batteries. Be sure that the <Color>, <Brightness> settings are not at their lower limit. Poor color: Adjust the <Tint> and <Contrast>. The operating LED is lit up: Refer to Corrective Actions According to LED Indications. Lines appear on screen: Because noise may occur when using your PC, adjust the frequency of the screen. No external device screen is displayed: Check the operating status for the external device and check whether the adjustment items, such as the Brightness and the Contrast have been changed correctly in the <Mode> command screen of the Projector menu. As mentioned above, check the adjustment items such as the Brightness, Contrast and Color in the menu. If you want to restore various settings to their factory defaults, run <Factory Default>from the menu.